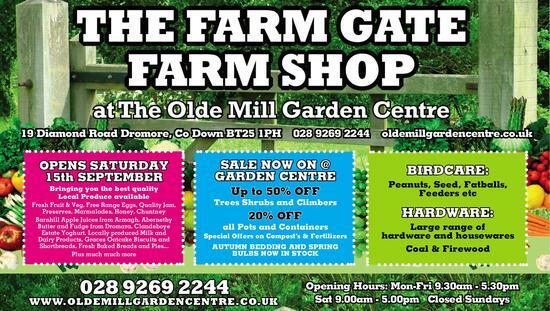 With so many excellent plants and shrubs available at an affordable price, the Olde Mill Garden Centre is perfect for garden products that don't compromise on quality. For nearly a decade, we have been supplying the whole of Dromore and the surrounding areas with an excellent service at a low price. Unlike the large DIY Stores and Supermarket owned garden Centres we take pride in the fact that the VAST MAJORITY of our plants are sourced locally in Northern Ireland from some of the best Nurseries in Europe, Our Bedding Plants and Vegetable Plants are 100% Local with a small selection of specialist plants brought in from Holland and England. Farm Shop opening soon !